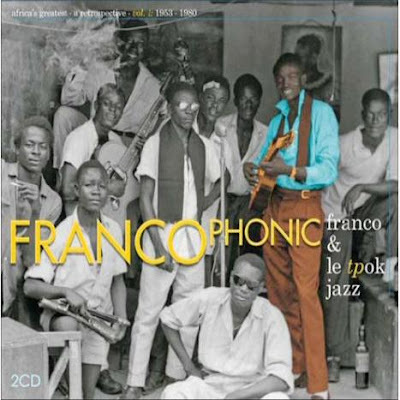 Back in 2000 Gary Stewart, author of Rumba on the River, mentioned a four CD retrospective being prepared by Sterns entitled Francophonic - The Essential Recordings of Franco Luambo Makiadi, King of Congo Music and his OK Jazz 1953-1988 (STCD 3015). This finally sees the light of day on November 17 when "FRANCOphonic - Africa's Greatest, A Retrospective - vol 1 : 1953-1980" (STCD 3041) is released by Sterns. My introduction to Franco came in the early '80s midst the first wave of African sounds being imported and subsequently released in the UK (and then exported to South Africa). The double LP I purchased, featuring Josky as lead vocalist and Michelino on lead guitar (Franco et Josky CHOC CHOC CHOC), had multiple overdubbed guitars but contained the hit single Partage. Beyond the odd late '80s vinyl LPs picked up in France it was only much later that I had the opportunity to explore his back catelogue properly with various Sonodisc CD reissues in the nineties. His two volume 20th Anniversdary still gets plenty of listening time at matsuli HQ. Thats about to change. This re-issue, the first of two, has been done in the recent Sterns 2cd/booklet/slipcase style of their recent Sylliphone, Bembeya, Tabu Ley, Mbilia Bel and Balla et ses Balladins releases. Brilliant photographs from Jean Depara and detailed essay from Ken Braun. And so as a treat and nod to Mr President-elect here is Franco's massive tune Liberte. 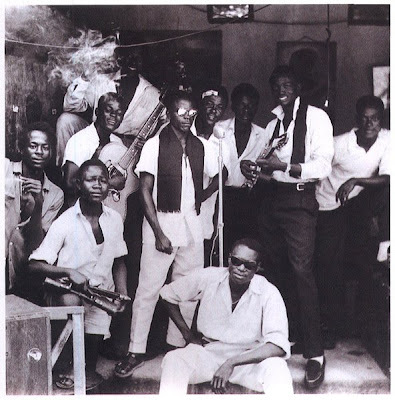 If, like me, you enjoy the slightly slower bolero style of Congolese rumba then check out the wonderful mix posted by worldservice.nl available here.